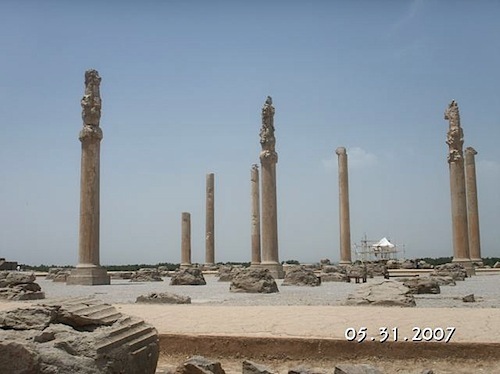 With the civil unrest gripping Iran, I remember our trip to Iran two years ago and some of the fond memories. I hope the unrest will be resolved without much bloodshed. 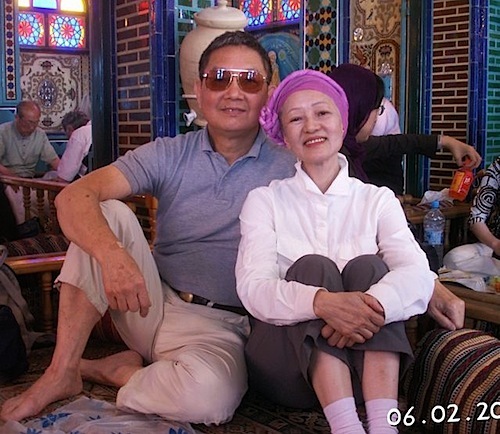 Sally and I joined a tour group in Hong Kong to visit Iran. 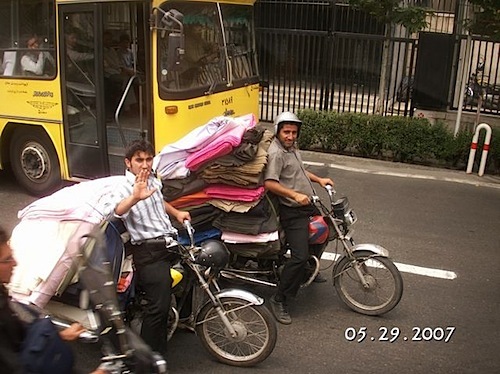 As we were forewarned about the dos and don’ts in Iran, we were prepared for a rigorous trip in a joyless country. 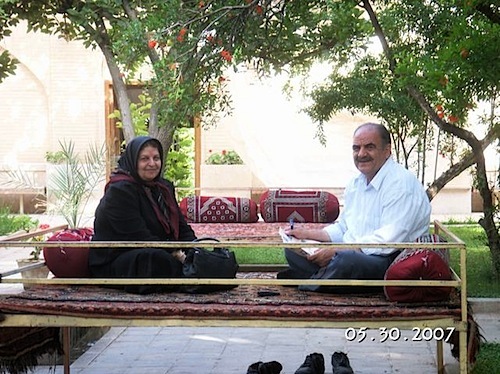 To our great surprise, the Iranian people were extremely friendly towards us. 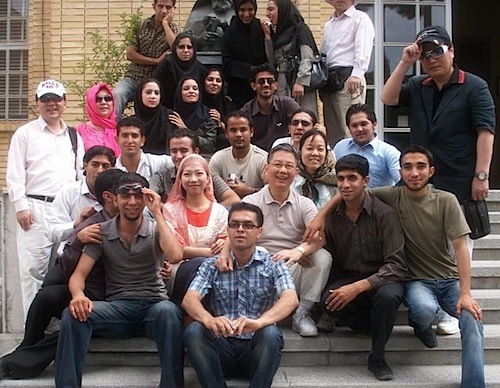 I don’t know if this is their nature or because we were a Chinese group and the Iranians felt affinity towards Chinese. We were mobbed by young people who wanted very much to take pictures with us. Their friendliness appeared genuine and spontaneous. We were only too happy to be overwhelmed by them. Two brothers grabbed me to take a picture with me, startling me. More mature folks showed their friendliness in subtle and reserved ways, but we felt their warmth just the same. Even motorcyclists waved to us in our tour bus. 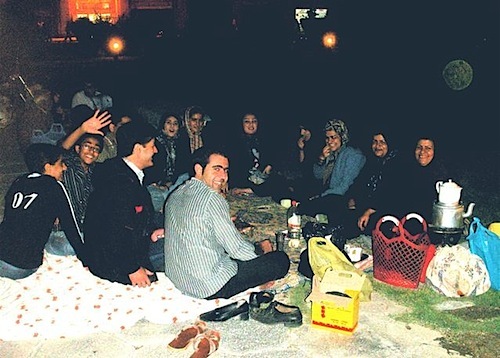 We chanced upon a family having a picnic in a public square at night. They insisted that we join them for tea. 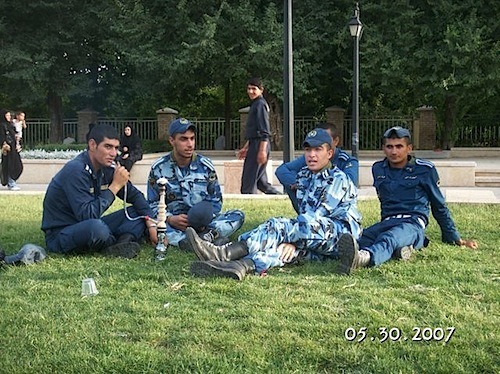 These soldiers were resting on a lawn, smoking a water pipe. I hope they are not involved in the fighting with the civilians. Religious fervor was palpable. 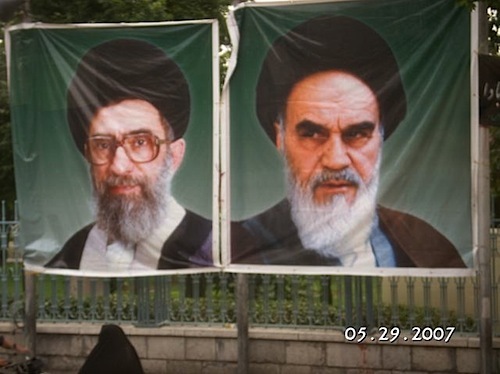 Pictures of the supreme ayatollas were hung up in many parts of the cities. 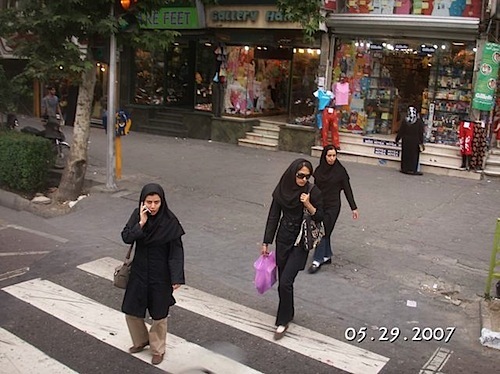 Iranian women were required to cover their hair and limbs. Elderly women wore burka, and younger women made fashion out of the requirement. The younger they were, the shorter were their tunics and more of their hair was shown. Even school buses were segregated. After several days of separation, members of out tour group violated the ban on intimacy and held hands in public. I wonder if we got blacklisted. The only time modesty was strictly enforced was our visit to a mosque. 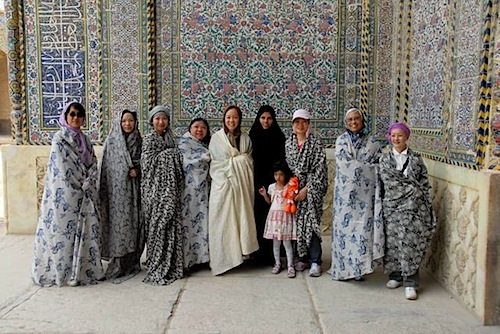 The women of our tour group donned rented shrouds and be Iranians for awhile. 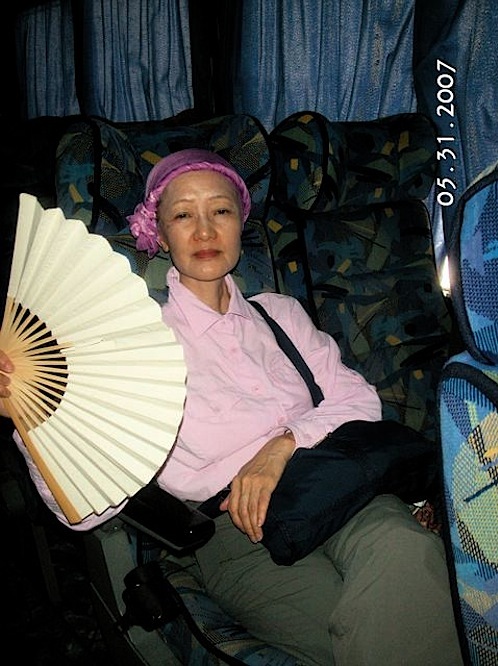 Sally initially covered her hair and neck properly. 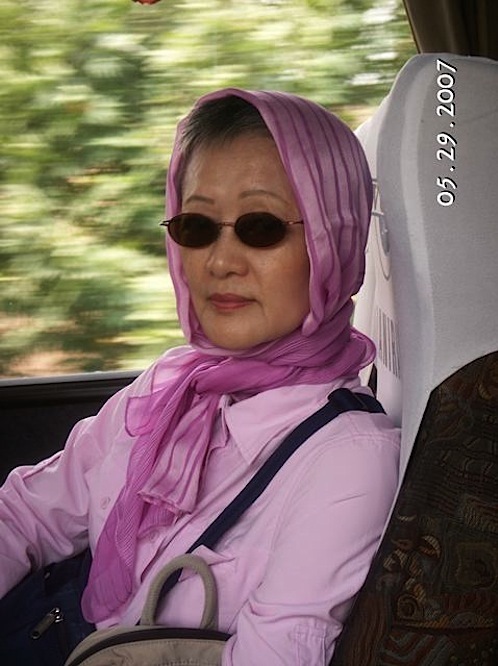 After a few days of suffering hot sunny days, she tied back her scarf and showed her neck and most of her head. She was pressing her luck. Our visit to Persipolis was the highlight of our tour. The carvings from 2,400 years ago were still vivid and detailed. 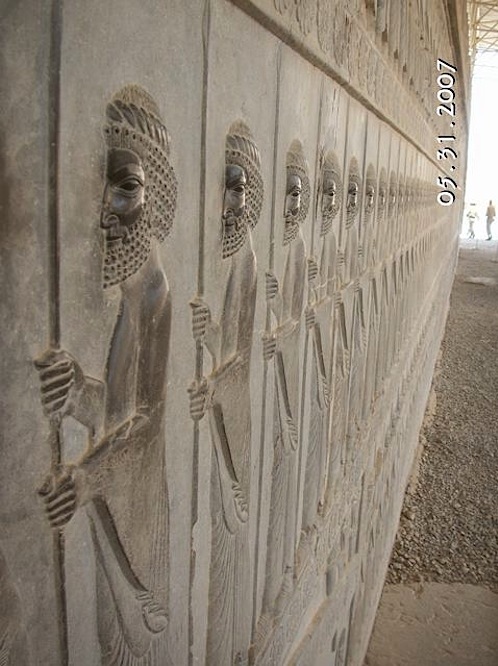 These were the Immortal Guards of Persia. 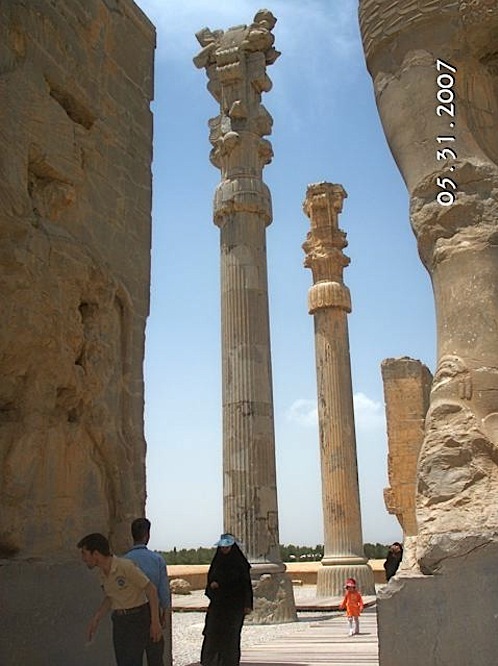 Persipolis was destroyed by Alexander the Great when he was drunk. This palace was monumental, impressive, and built to last a thousand years. Too bad it was burned down by a drunken barbarian. 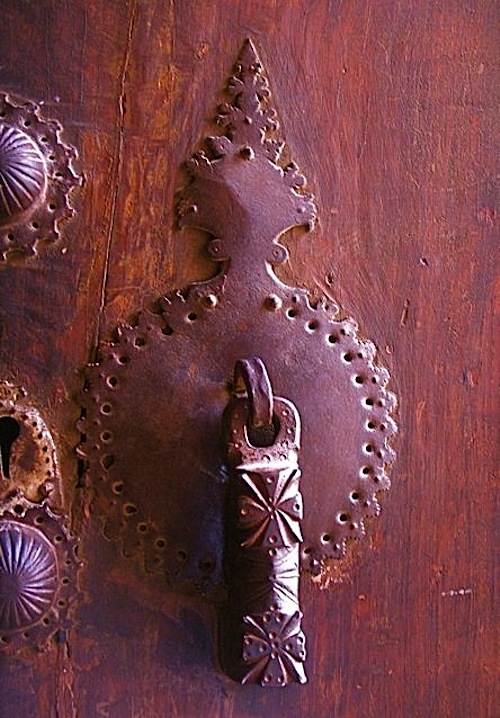 Most of the nice relics were taken by European looters and are shown in Western museums. Only a few columns and relief carvings were left on site. 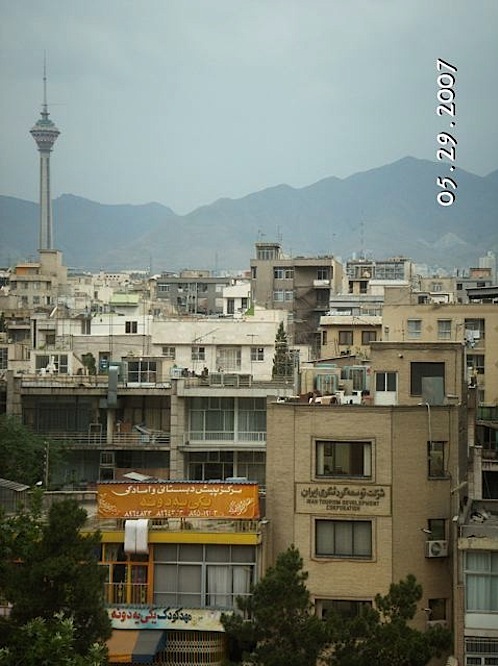 The capital city, Tehran, was surrounded by mountains. 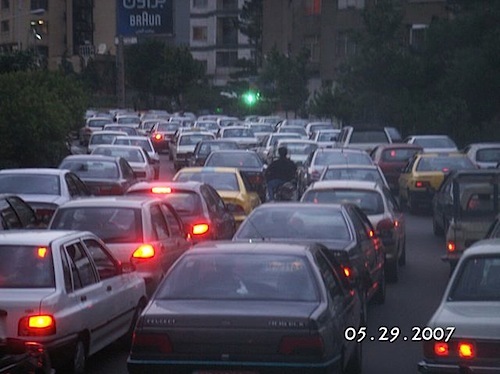 Traffic jam during the rush hour was unbearable. 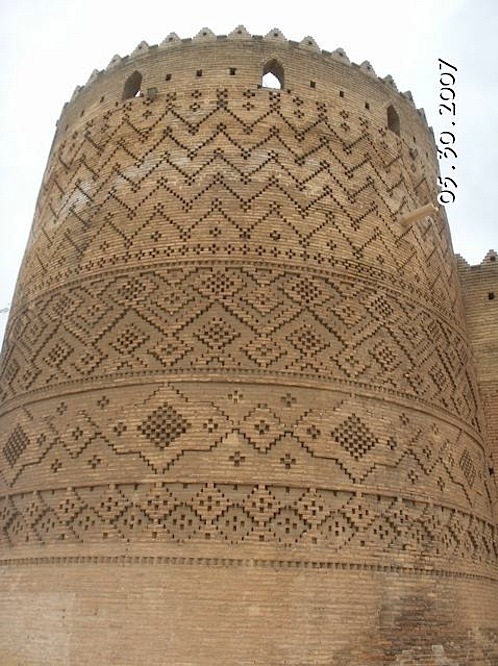 The guard tower of a fortress was beautifully decorated by intricate patterns of brickwork. Door knockers came in pairs. This one was male. This one was female. I wonder why the religious police of this puritan society did not remove these explicitly sexual symbols. Cities had buildings to house pigeons. 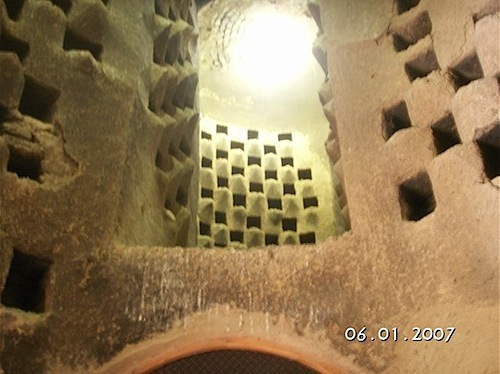 The interior of these pigeon houses was full of pigeon holes. As our Hong Kong tour group was still aware of the threat of avian flu, it took some recklessness to enter these houses to view the pigeon holes. 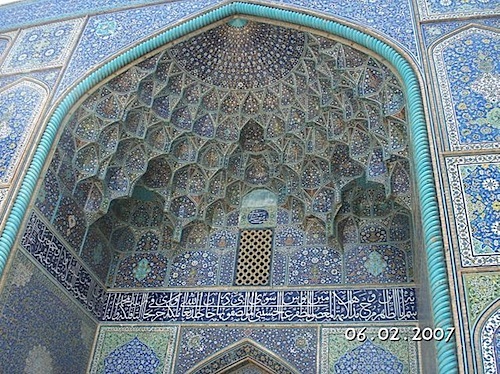 The major mosques of Iran were beautifully decorated with colored tiles. The geometrical complexity of the building was breathtaking. 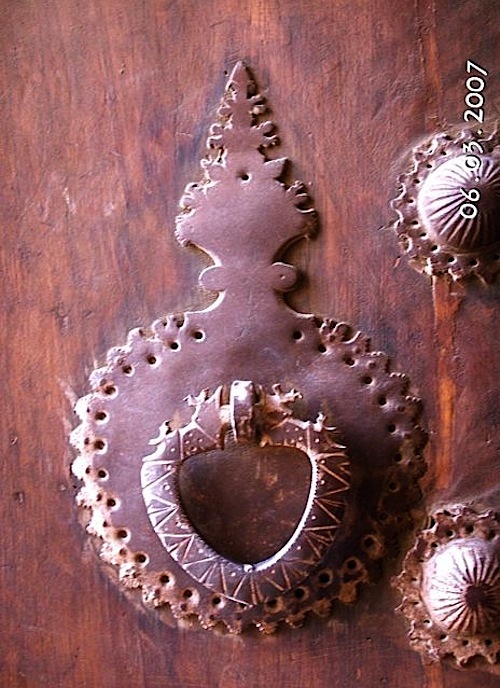 The intricate decorations were dazzling. 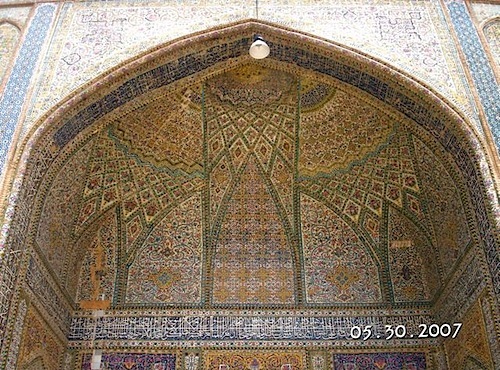 This was the Iwan Mosque in Shiraz. 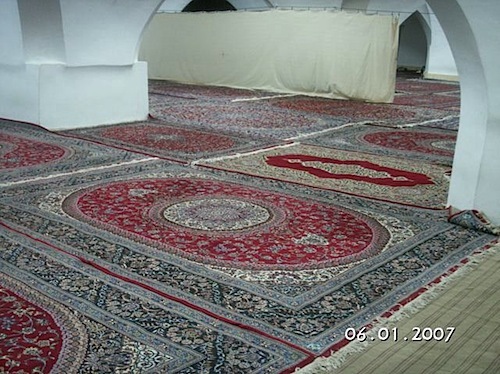 In the prayer room of the mosque, Persian carpets covered the floor from wall to wall. I would be happy to own just one of these carpets. 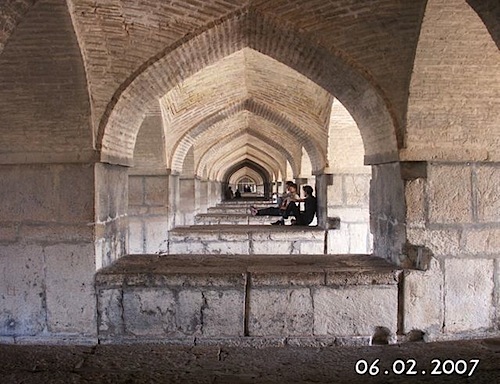 Under the multi-arched bridge of Esfahan, people sat and cooled off. 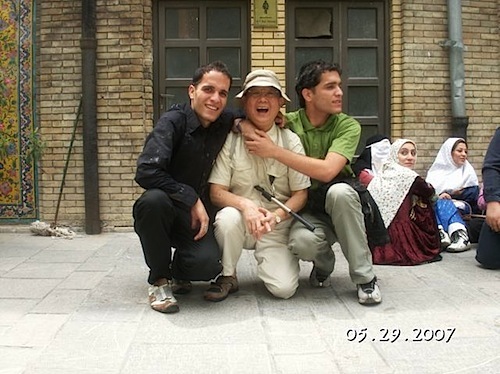 I stood on the bridge in Esfahan, covering my head with neck protection. Iran was conquered by the Mongols who brought Chinese painters with them. 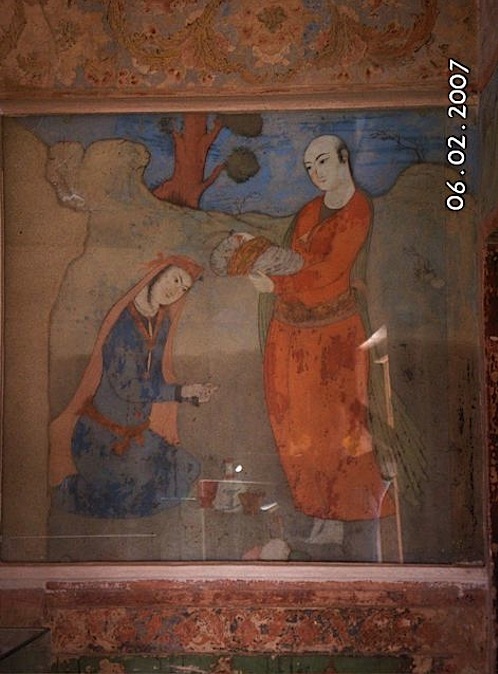 Iranian art retains some characteristics of Chinese painting, especially the features of people in their paintings. 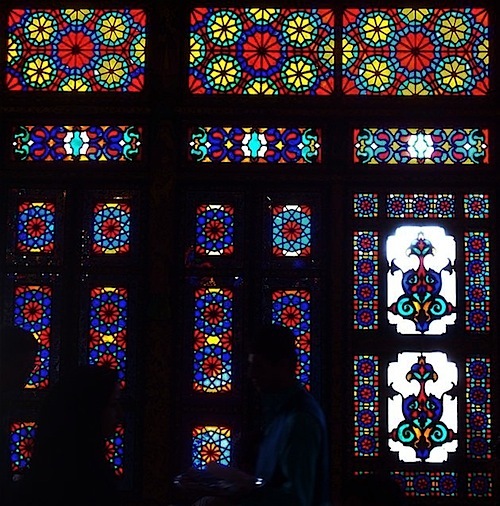 The stained glass windows of a restaurant in Esfahan was lovely. Sally and I sat bare feet on day beds for lunch. 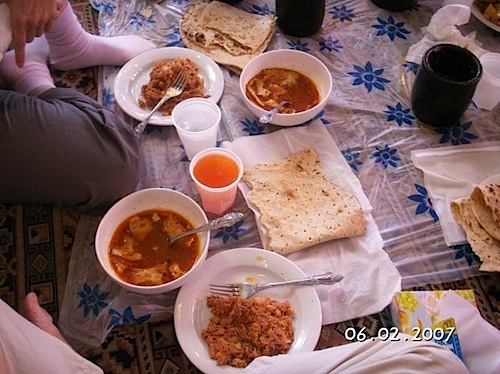 Lunch composed of mashed lamb stew, lamb soup and rolls of bread. 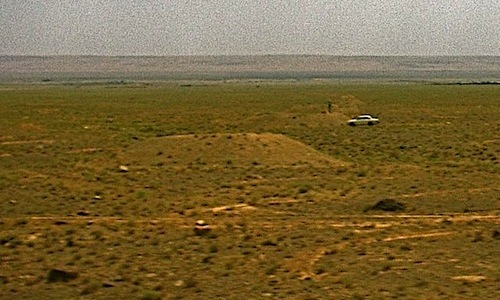 When traveling in desert, we saw lines of earthen mounds. These mounds were excavations from vertical shafts that go down to underground water ducts that brought mountain water to desert towns. 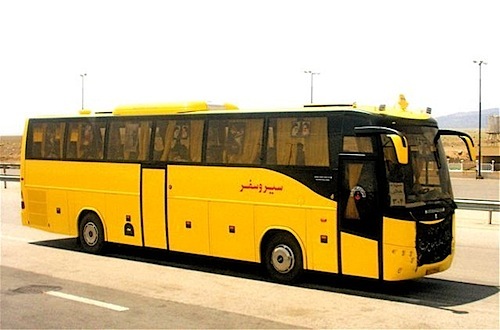 The highway was full of buses carrying the faithfuls to Tehran to attend a mourning ceremony for Ayatolla Khomeini. The buses were segregated. 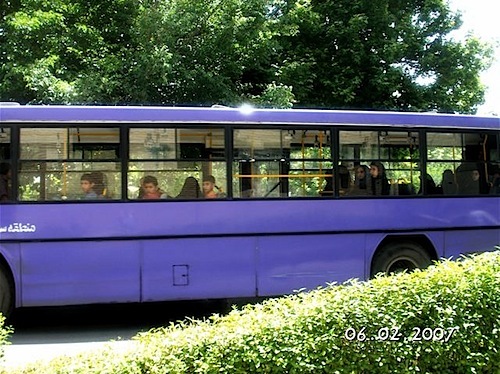 This bus carried only men. 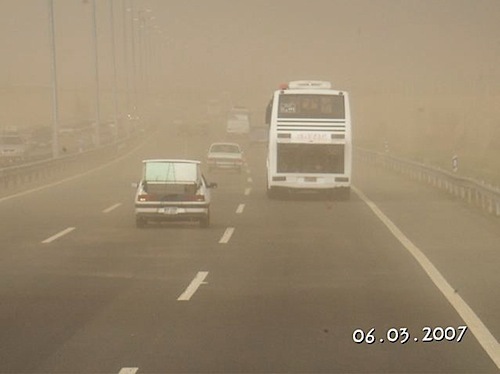 Our bus braved through a dust storm in the desert. At one point, our Iranian guide told us not to take photos since we were near Iranian nuclear facilities. 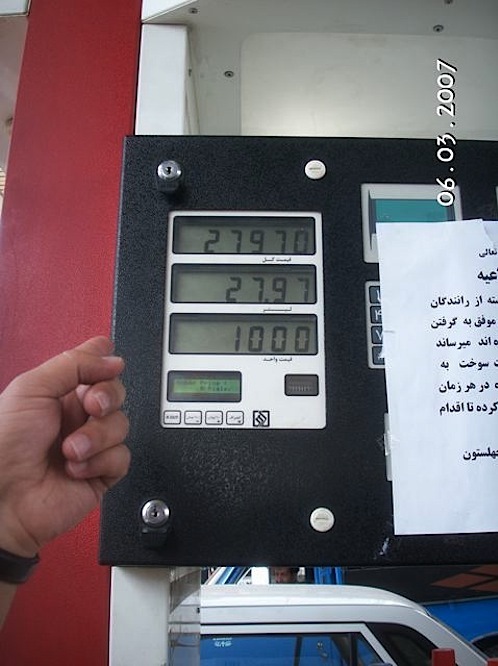 Gasoline was cheap in Iran. It costed US40 cents for a gallon. It felt like a time machine back to the good old 1960s. Posted by Robert Wu on Sunday, June 21, 2009, at 9:01 pm. Filed under Uncategorized. Follow any responses to this post with its comments RSS feed. You can post a comment or trackback from your blog.